WANT TO LEARN ABOUT WOLVES? 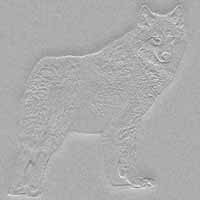 All through time the wolf has been praised as the King of the North American animal kingdom. It has always been regarded as a creature of both beauty and mystery, thus deserving of both respect and fascination. Our interest in the wolf may have more to do with our similarities rather than our differences. Both of us exist centered in strong family units depending on set social structure. We appoint leaders of our packs that hold firm abilities to care for our families. And in both wolves and man, rituals strengthen relationships, maintain order, and enforce discipline. Still, though, wolves remain in the wild and man has moved away, but part of us still longs for what we once had. In the book, Brother Wolf: A Forgotten Promise, author Jim Brandenburg wrote "...I feel about wolves something just short of jealousy. I am in awe. Their persistence, their endurance and their strength are beyond human capacity." Species: Almost all North American wolves belong to the species called gray wolves (Canis Lupus). A separate and endangered species called the red wolf (Canis Rufus) exists in the southern United States; however, almost all of them are in captivity. Size: Adults range from 5 feet to 6 1/2 feet from nose to tip of tail, stand from 26 to 36 inches high at the shoulders and weigh between 75 and 120 pounds. Female wolves are smaller than males. Primary Food: Deer, moose, caribou and elk, although they will eat rabbits, beaver, rodents and fish. Habitat: One of the most adaptable of all animals, wolves can live in a variety of habitats, preferring large areas of heavily wooded wilderness. Range: Once widely distributed across North America, most gray wolf populations are in Canada and Alaska. Minnesota has a population large enough to maintain itself while Wisconsin, Michigan and Montana have less stable populations. Wolves were reintroduced to Yellowstone National Park in 1995. Life Span: Approximately 10 years in the wild. Natural Enemies: None. Wolves are at the top of the food chain. Only humans pose a threat to their existence. Disposition: Although there are no reliable reports of a healthy wolf ever attacking a human, avoidance is recommended. Wolves will almost always avoid humans, though some curious animals will watch a human from a safe distance. Observation Opportunities: Very limited because of their small numbers, solitary nature and because they are most active at night. During heavy snows, wolves may be seen on or along infrequently traveled roads. other wolf lovers have visited this site!